You can see that for both 3.14 and 3.99 you got just 3 because type casting doesn't do any rounding before truncating value after the decimal point. This is the right way to convert float to int if you are interested in rounding before conversion. Math.round() converts a floating-point number to the nearest integer by first adding 0.5 and then truncating value after the decimal point. Let's see the a complete, running Java program to test whatever you have learned so far. In the following example, I have combined both casting and rounding to convert float to an integer in Java. This convert some floating point numbers to int. You can further enhance this program to accept a floating-point number from the user and then convert it to an integer. If you are new and don't know how to read user input then check out this tutorial. * Java Program to convert a float value to integer. 1) Even though both int and float are the 32-bit data type, but the float has a higher range than int. 2) You can downcast float to int to get rid of decimal values e.g. casting 3.2 will give you 3. 3) Typecasting doesn't perform any rounding, so casting 9.999 will give you 9 and not 10. 4) If you want to round before conversion then use Math.round(float), it will give you the nearest integer. 4) Remember, Math.round() is overloaded, one accept the double and another float. Since floating point number is by default double, make sure you put "f" suffix while passing constant values to Math.round() method. 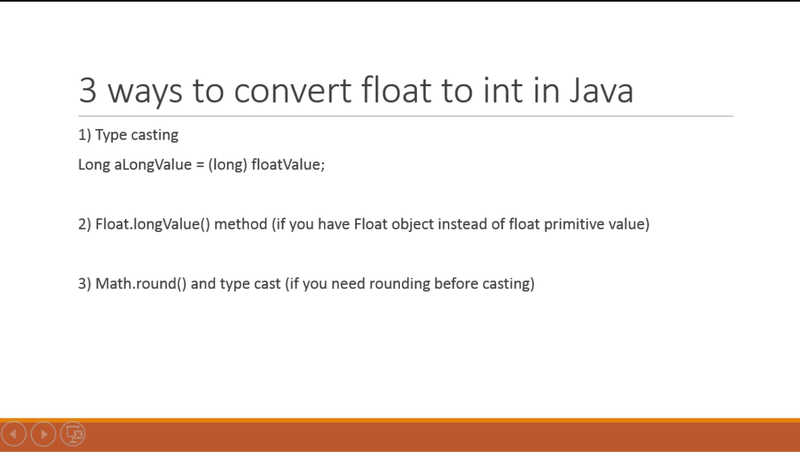 That's all about how to convert float to int in Java. Even though you can simply convert a float primitive value to int primitive by downcasting, but you must remember that type casting doesn't do rounding. It just throws away anything after the decimal point. If you want to round the float to nearest integer then please use Math.round() method, which accepts a float and returns the nearest integer. Since this method is overloaded, make sure you suffix "f" to your values to ensure that they are considered float and double, otherwise the compiler will call Math.round(double) method, which will round but return long, and you need to further cast into int to avoid the compiler error.